Electricity in Argentina is 220 volts, 50 Hertz, AC. In recent years Argentina has switched to Type I plugs and outlets. These are diagonal with flat prongs. The neutral and line wires are reversed from that used in Australia and other countries. 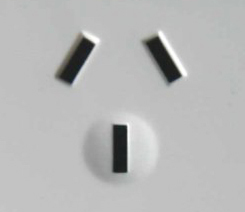 Some buildings still use older Type C outlets which have round prongs. 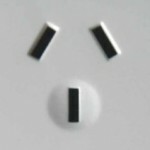 Some buildings have hybrid outlets which accept both Type I and C plugs. Depending on where you are from, you may need a plug adapter or voltage converter. When using a plug adapter (which simply changes the shape of the plug so it will fit in the outlet) make sure the voltage of the appliance is compatible. This information is listed on the appliance. For example, North American visitors can usually use a plug adapater with a laptop computer since most laptop computers can accept 120-220V and no voltage converter is required. This may not be true for other appliances such as hair dryers. The appliance may not be designed to work at 220V. Before moving to Buenos Aires from the U.S. I bought a $30 voltage converter at Target. I use it with my hairdryer and my flatiron. It works fine. For my laptop I purchased an adapter from a street vender in Buenos Aires (in Micro Centro) for 12 pesos. They’re pretty easy to find. We’re planning to buy a voltage converter to bring with us for our baby monitor, etc. Do we need anything to convert 50 Hz to 60 Hz? My boyfriend thinks that we do but I can’t find any info on that online.